Keep a close watch on your property with the WiseNet P Series PNM-9320VQP 2MP Outdoor Network PTZ Dome Camera with Quad Camera Body from Hanwha Techwin. 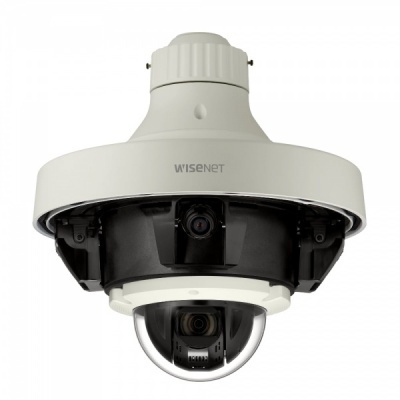 Designed for five-channel video surveillance, the PNM-9320VQP incorporates a 2MP PTZ camera plus a quad-directional camera body that can be customized with your choice of separately available 2MP and 5MP sensor modules. The 2MP sensor modules integrate 2.4, 2.8, 3.6, 6, or 12mm fixed lenses and the 5MP modules 3.7, 4.6, or 7mm fixed lenses to fit a variety of applications. Equipped with a 1/2.8" 2.4MP CMOS sensor and a 4.44-142.6mm varifocal lens, the PTZ camera captures video at resolutions up to 1920 x 1080 at 60 fps in fields of view ranging from 61.8 x 36.2° to 2.19 x 1.24°. An automatic IR cut filter provides day/night functionality while image enhancement features including a 150 dB wide dynamic range and automatic white balance enable capturing images in varying lighting conditions. Moreover, the PTZ camera offers 360° endless pan, 190° tilt, and 32x optical zoom. The PNM-9320VQP uses HPoE technology, enabling you to run just one wire for both data and power. ONVIF compliance ensures compatibility with a wide range of surveillance devices.